I missed break-up on the Tanana River near Fairbanks this year—traveling—but the mighty Yukon River, 100 miles to the north, holds its ice longer. 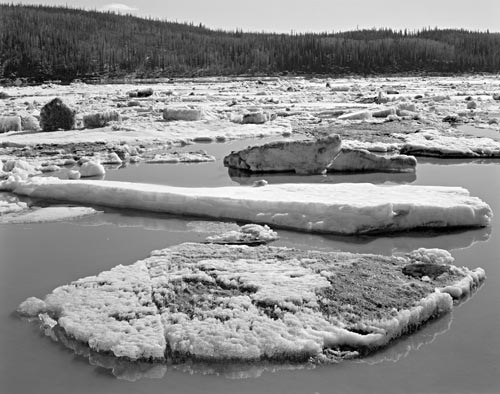 When I got a phone call last Friday telling me that the ice was beginning to move at Stevens Village, 27 miles upstream from the Yukon River Bridge on the Dalton, I packed my battered RV, loaded my wife, my son, and our aging dog and headed for the river. Break-up is an event in Alaska, defining the transition between winter and summer—the intense sun of April and May melts the snow in a rush that lifts the rotting ice on the rivers, sweeping the rivers clean. The rhythm of life changes—winters are cold and dark, but the country is accessible by snowmachine—summers are warm and light, and one can travel along rivers by boat, but mostly the uplands are inaccessible. When we arrived at the river at about 10 PM in the evening, the ice had already moved some—there was about a half mile of clear water below the bridge—but the ice had stopped moving, not really jammed—just stuck. 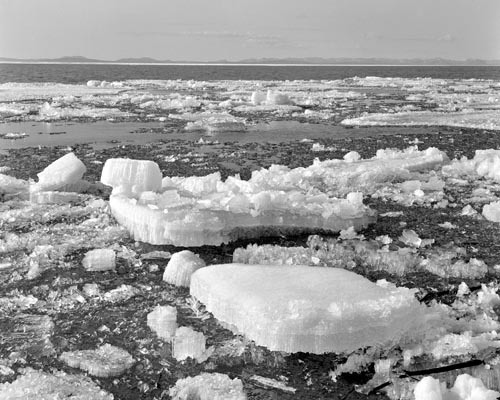 We walked along the edge of the water, admiring the chunks of stranded ice on the shore, waiting, watching. We went to bed about 1 AM, and awoke in the morning to find the ice in exactly the same places. All day on Saturday, the warm sun shone, and the sound of water dripping from the ice piled along the river banks could be heard. But the ice didn’t move. In late afternoon, we sat by the side of the river, enjoying the warmth, waiting, in silence. My son Ben got a stick and started poking at some of the partially floating ice, eventually starting a slow motion parade of large ice chunks along the river bank. My wife fell asleep, as did the dog. I sat and watched the river, the ice, the sun. Break-up feels like an unscheduled holiday, a natural tradition, and like human holidays, much of the power the event holds is due to our memories. Where I grew up in Pennsylvania, ice formed on the rivers only during infrequent winter cold snaps, and break-up was not an event. My first break-up was the one I saw in Kotzebue, in June of 1987, a few weeks after coming to Alaska for what we thought was the summer. We’ve managed to stay a bit longer—and break-up feels like the beginning of another year here—a defining moment in the rhythm of this place, a time to both remember and to plan. Or take a nap in the sun. Dennis, I enjoyed your story about the ice breaking up. What an event! When you and your family visit the area please try to stop by. I have to say you look a lot like your Mom. The dementia is tough. We have been through that, too. I have a blog now. Just started it in April. I like to photograph the landscape, too. I can’t seem to do much with winter around here. Any ideas?